I've been out of town for a week and although I did manage to read through a couple of books, I haven't had a change to write up reviews yet. So while I'm waiting for a moment to write my thoughts up on a few titles, why don't we have a little giveaway, eh? 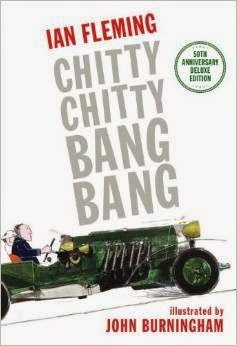 You might recall that I read Chitty Chitty Bang Bang last year and absolutely loved it. In fact, I loved it so much that I listed it as one of my top favorite reads for the year 2013. I think everyone ought to make time to enjoy the pleasure that is this story. Candlewick Press recently released a 50th year hardback edition of this book and I asked them if they'd be willing to host a giveaway for my readers here at Reading to Know. They were very agreeable and so I am excited to offer you a chance to win a copy for yourself. Whether you win or not, I highly recommend this read to you. It is so fun, imaginative and quirky. Yes, I would totally gift a copy of this book this Christmas to any number of people with small children because it's a fun story (which is not at all like the movie, by the way). Can't recommend it highly enough. Would you like to win a copy of this 50th year hardback edition for yourself or for a friend? All you have to do is leave a comment below. This contest is open to U.S. Residents only and will be open through Friday, November 21st. Please note that you must leave a valid e-mail address in order to be entered into the drawing. Lately I have had a few people fail to do this and I have no way of contacting you without an address! THIS CONTEST IS NOW CLOSED. THE WINNER, as selected by Random.org., IS #18 - JANET! CONGRATS! Many thanks to Candlewick Press for offering a copy of this delightful book to one of my readers. We enjoyed this book too and would love a copy. this would be great.. just in time for christmas! Me! I think we have a ratty old paperback around, but that's it, and we've never read it. Your first review made me want to read it! As soon as I saw the title, I smiled. Monica used to LOVE that movie, and I don't recall it being my fave. Don't think I ever read the book. Glad you enjoyed it! My daughter recently finished reading this aloud from a library copy, but I'd love to have one of our own! I shared it on FB, too. I really should read this to my kiddos. . . This was such a favorite of me and my younger sister. I would love to give this to her for Christmas. What a surprise that would be! ooh! I'd love to read this! This would be wonderful!! I have not yet read it let alone read it to my kiddos but the movie is a favorite in our home. I would love to read this book to my daughter. We love the movie, and I've always been curious about the book. I enjoyed this musical on stage in London, would love to read the original book, though!